Dr. Harold Popp holds degrees from Ottawa University, Indiana University and a Ph.D. from the University of Iowa. He has spent a lifetime involved in the world of the arts as an educator, administrator, composer, conductor, trombonist, author, and editor. He is currently adjunct lecturer in music in general studies at the Indiana University Jacobs School of Music. As a professional trombonist, he has performed with the Kansas City Philharmonic, Opera and Ballet, South Dakota Symphony, New England Symphony and Brass Quintet and the Tallahassee Symphony. He has also recorded an compact disc of his own chamber music for trombone: Pieces from the Wood Box (Coyote Records). The Trilogy is included on that CD. 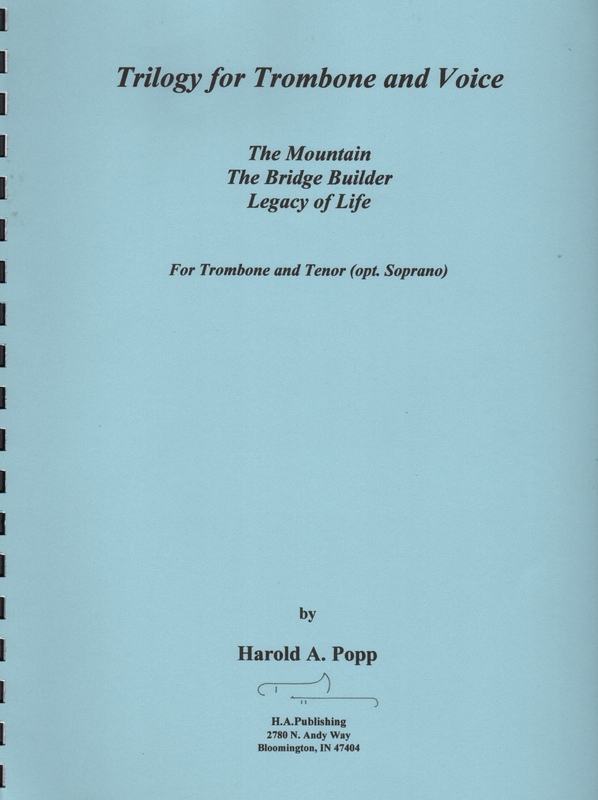 The Trilogy dates from 1988 when the composer was chair of the Music Department at the University of South Dakota. Its three movements are: The Mountain, The Bridge Builder, and Legacy of Life. The three texts utilized are all related to a philosophy of life. The first and third are by the composer and the second is by the prolific early 20th century poet Will Alan Dromgoole. The Mountain views the similarities between human existence and the personified life of the mountain. The Bridge Builder describes a life dedicated to the service of others. It is a description of the poet’s father. The Legacy of Life contains seven lines of text, each a philosophical statement. The tenor part is quite demanding. The composer states that a soprano can also be used but the preference is for the tenor. The harmonic language is chromatic, non-functional, but tonal. Rhythms are traditional; meters are not indicated as both players read from the score. The trombone part requires a mature musician. It is technically within the abilities of an advanced student. Layout and printing are both first class.